In the case of PPDD, “the people” is definitely a nodal point. “The people” is always in opposition with “them”; “them”, in our case study, is represented by the traditional political parties which have been messing with the people’s jobs over 20 years, the corrupt political elites, working against “us”, the honest, decent Romanian people. The foreigner becomes quite a recurring theme for the party’s discourse; behind it stands the idea that Romania’s economy was somehow hurt by foreign companies which control its national resources (Florian, 2012:11-13). The party’s program creates a link between the foreign companies and the establishment; seeing how the latter is corrupt, it must definitely be serving the foreign. This aspect strengthens the “otherness”, at the same time, avoiding the risk of diluting the people’s attention towards two enemies. In this manner, a chain of equivalence was created around the nodal point of “the people”; more than once could one hear the party’s leader talking about “the people’s trust”, “the people’s interest”, or “the people’s right to a job”. Following discourse theory’s insights, PPDD’s political program may not look so surprising. The public opinion in Romania was and still is generally unsatisfied by the traditional political parties which, after the fall of the communist regime, alternated in power, but could not shake the perception among the poorer masses, that not much has changed in the post-communist society. Moreover, the economic recession strongly hit the Romanian economy and implicitly increased unemployment, which determined the government to ask for foreign financial help (the link between corrupt elites and the exploiting foreigner). Put in this context, PPDD seized the opportunity and managed to tap into a segment of the electorate which had unsatisfied demands in these areas. Discourse theory argues that the actors behind discourses in a society are in a continuous fight for hegemonic power; however, power is defined not as the control over state institutions, but the control over the discourses providing social representation. Hegemonic discourses are those who somehow manage to convince the society as a whole that it is their principles which should be used in reading (or “changing”) the past, the present, and shaping the future. In other words, the people become convinced of the fact that one certain representation of a discourse is the only one accurately explaining the world as such. In societies with many unsatisfied social demands, the demands of a relatively small group become the signifiers of a popular discourse (although these demands may seem -or even are- unrelated) (Laclau 2005:39). PPDD fits extremely well descriptions made by Ernesto Laclau and Chantal Mouffe. What seem to us to be very superficial political symbols and programs is actually what makes populist parties successful. The homogenizing function is fulfilled exactly by the name of the leader (ibid. p.40). In the case of PPDD, its unusual demands and promises, levitating around “the people”, are held together and stick to the name of the leader, Dan Diaconescu, which even had the audacity (or inspiration) to name the party after himself. Chantal Mouffe argues that the rise of the populist parties throughout Europe is the result of the incapacity of traditional parties to provide some form of identification for the electorate; the tendency for the right and left to arrive at a consensus regarding the way a society should be organized made it extremely easier for the populist parties to create an “us” versus “them” paradigm. Mouffe also argues that the easiest collective form of identification to tap into is “the people” (Mouffe, 2005:55). PPDD found a window of opportunity in the Romanians’ general lack of interest for politics, especially in the last years; between 1990 and 2008, the voter turnout declined by more than 50% (IPP 2009:4). This can be explained using Mouffe’s reasoning that political parties are failing to provide some sort of identification for citizens. Moreover, the “corrupt establishment” is associated with the political elites and the foreign, and then antagonized with “us”, the “good” Romanian people. Traditional political parties have largely ignored the threat represented by such a discourse; this may be explained by the fact that the social-democratic-led alliance was well-ahead with over 60% of the votes, while the liberal-democratic-led alliance barely scraped 15% of the votes; given this, one can say that, from PPDD’s point of view, getting into Parliament was never really a contest. If the discourses in a society are constructed through hegemonic struggles, these struggles would be rendered moot without the delineation of political frontiers. This generally happens when a discourse tries to create a threatening “other” and antagonize it against its own values. In every instance, the “us” is characterized by the “good”, the “right” part of society, while, on the other hand, by “them” is meant those malicious parts of society which have to be condemned and excluded. Antagonism is important because it helps stabilize a discourse, it gives it a sense of coherence. There cannot be an “us” without a “them”, as Mouffe argues, and so, the very identity of a (populist) group depends on the exclusion of another. This is exactly the failure of the ‘Third Way’ politics and one explanation for the rise of populist parties. Traditional parties are nowadays ignoring the (important) role that ideology has played for people’s identities and have gradually mushed their ideologies together. PPDD seized this opportunity as well. The very first “foundation” of the party, as expressed in its program, talks about a “party which can no longer stand the chasm which separates the people from the governance”; the program continues its harsh criticism against the political elites and establishment in general. This aggressive electoral campaign was conducted along the same lines during the party’s leader extremely frequent televised appearances. Any discourse is finite. It becomes dislocated when it faces events that it cannot explain nor represent. Even though they have a degree of flexibility, all discourses reach a point in which they cannot provide any more plausible explanations for the world and empty signifiers are put “back on the market”, until they can be combined again in a discourse in a plausible manner. A good example illustrating this situation is brought by Chantal Mouffe. The right-wing populist Freedom Party of Austria (FPÖ) had managed to reach 27% in November 1999 after, only 10 years before, it was on the brink of extinction. After getting into the Parliament, it suddenly started losing votes across the board and ended up only 5 years later receiving little over 6% of the votes. Today, the party’s existence is put into question again (Mouffe, 2005:67-68). Mouffe argues that getting into the government (i.e. becoming the establishment) was the worst possible move for FPÖ, which entered into an internal -not external- crisis immediately after. Getting into the government did more harm than good for the party. Only a few months after getting 68 places in the Romanian Parliament, 8 members of PPDD moved to the leading social-democrat group. In January 2014, a larger number of members chose to move, rendering the party unable to mount a group in the Senate. The trend continued. 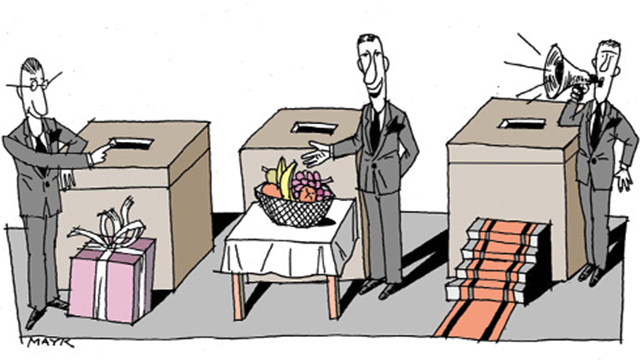 PPDD failed to get any seats in the European Parliament in May this year. In spite of the disastrous results, PPDD still managed somehow to be represented in the cabinet formed by the social-democratic alliance. It is the same government and the same alliance that they were denouncing as evil only months ago. Once becoming part of the elites that it had been antagonizing only two years before, the party lost its appetite for naming and shaming and, even more dramatic for their leader, lost most of its political support. Jacob Tofing argues that, since individuals are attracted to acts of identification, in politics, they become split subjects. The acts of identification that individuals engage in have exactly the purpose of eliminating this lack of a full structural identity. Faced with this paradigm, the split subject tries –sometimes desperately- to “recapture the illusion of a full identity by means of identifying itself with the promise of fullness offered by different political projects” (Tofing 2005:16-17). The problem is that this illusion never gets to become a reality and the search for it might turn very dramatic, traumatizing. In the case of PPDD, we can say that its rise may be explained by the existence of “traumatized” split-subjects in the Romanian society. While Romania is a democracy, however it is a young one; moreover, as already discussed, the society was relatively shocked or in crisis, if you will, due to the budgetary cuts and the loans governments had contracted in the previous years; if we add to this the fact that Romania is one of the poorest countries in the European Union, one can argue that, compared to Western counterparts, the Romanian society was in a quasi-crisis, to say the least, during the 2012 electoral campaign. The nature of PPDD’s electorate points to this idea: most of PPDD voters do not have a college degree and almost a fifth of them did not even finish high-school. In a capitalist economy, competition might have made these voters feel ‘marginalized’, without a sense of belonging, due to difficulties related to finding a job and acquiring a satisfactory status in the society. PPDD fits the description of a populist party and, given the social, economic, and political context before and during the 2012 general elections in Romania, the party’s successful opportunism should not be surprising nor neglected. On the other hand, PPDD also proves right Chantal Mouffe and Ernesto Laclau’s hypothesis that, once getting into power, populist parties lose most of their political support. Up to this point, the party’s policies have not been harmful, but questions about the democratic deficit in Romania must be raised. Moreover, both the traditional political parties and the electorate should be more careful in the future, since PPDD proved that creating a (successful) populist party, from scratch, in Romania, is a relatively easy task.